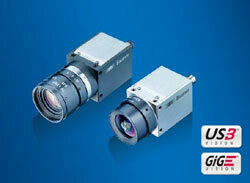 Baumer expands the successful CX and EX camera series with ten new models featuring rolling shutter CMOS sensors by ON Semiconductor and Sony, including sensors from the STARVIS series. With resolutions of 5, 10, 12 and 20 megapixel, these sensors deliver low noise, low heat generation and an excellent price-performance ratio. Hence, these new models are the ideal choice for cost-sensitive applications that require low-price cameras with high resolution and image quality comparable to a global shutter sensor, reducing system cost. Thanks to their GlobalReset function, which exposes all pixels simultaneously, even fast-moving objects are clearly captured at high image quality without the distortion seen with rolling shutter effects. First models are expected to go into production the 2nd quarter of 2018. The small CX and EX series USB 3.0 and GigE cameras include the latest rolling and global shutter CMOS sensors with up to 20 megapixel resolution and the uniform form factor of 29 x 29 mm. Users save time and money in realizing multi-faceted applications with individual demands on resolution, interface or functional range thanks to consistent mechanical, electrical and software integration. Furthermore, the small square housing with sided M3 mounts is easily installed with maximum flexibility even in tight spaces. The CX series offers more than 80 models, including IP 65/67-rated cameras with an operating temperature range from -40 °C to 70 °C, exposure times from 1 µs to 60 s and frame rates of up to 1000 fps using a ROI (Region of Interest). Resolutions from VGA up to 20 megapixels and outstanding image quality make the versatile CX series an ideal choice for cross-industry applications with the highest demands on image detail accuracy and throughput. Focusing on the essential such as standard-compliant basic functions and CS mounts, the EX series offers Baumer quality at a small price. With resolutions of up to 10 megapixel and a robust metal housing, these are the cameras to choose for the most common applications in industrial image processing.